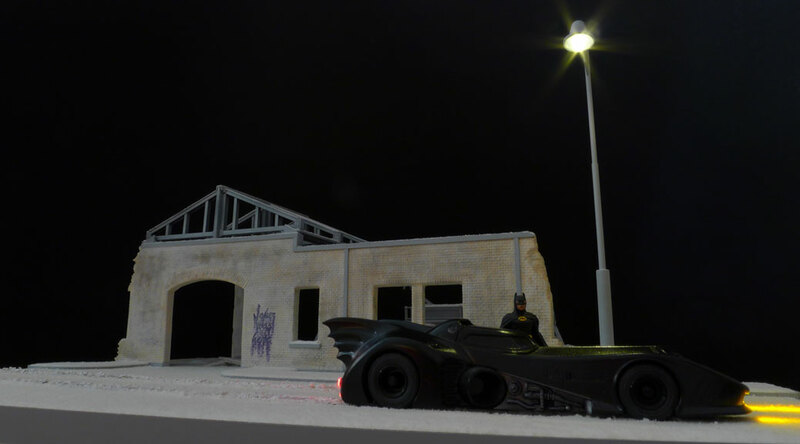 This diorama was inspired by the night scenes of the Batmobile stealing through snow-covered streets in Batman Returns (Tim Burton, 1989). I liked the contrast of the Batmobile against the fresh white snow. I used Bandai’s Batmobile, a white metal Batman figure, a kitbashed Miniart Ruined Garage, and roof trusses from a gantry crane kit. Everything else was scratchbuilt. German toy maker Marklin produced the first model train set in 1891. According to www.marklin.com, it consisted of a wind-up locomotive with cars and an expandable track system. 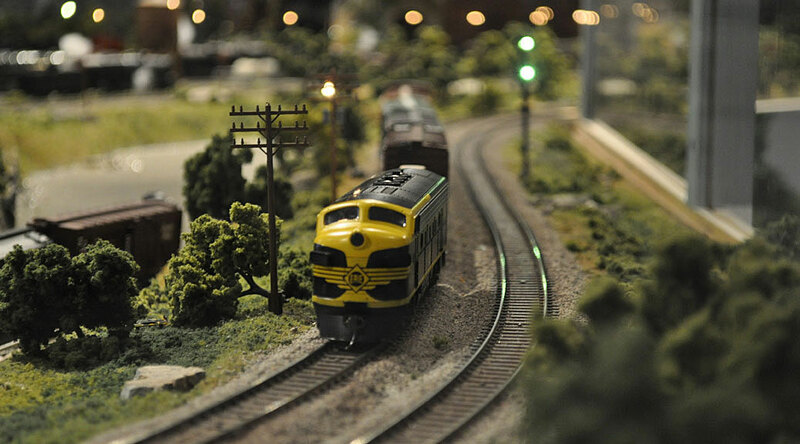 Electricity came to model railroads much later, and wasn’t popularized until the introduction of a 20-volt system in 1926, which replaced the former household current setup. These early train sets were commonly in O Gauge, which translates to 1:43 scale. In 1935, O Gauge was “halved” into HO (1:87 scale), opening up model railroads to a wider audience. Although little historical data exists on the subject, it seems likely that this was the point when it became practical to begin creating realistic miniature train layouts. By the latter half of the 20th century, HO was the worldwide standard for model trains. To this day, many model train retailers continue to emphasize HO stock in their stores, although N Gauge (1:160) is also very popular. About half a century after model railroads appeared, plastic kits came on the scene. Like model train companies, kit manufacturers introduced a series of scales (including 1:32, 1:48 and 1:72 for aircraft and 1:35 for military kits) which have been adhered to consistently ever since. It would have made things far easier for the diorama artist if model railroad and plastic kit manufacturers had agreed to a common set of scales, but you can’t have everything. This lack of matching standards means that we sometimes have to resort to a bit of poetic license when adding items from the model train store to our dioramas. If you’re creating a scene in 1:72 scale, HO scenery and landscaping products will work quite well, but HO vehicles will look a bit too small. Whether or not you like to get diorama accessories from the local model train store, diorama artists owe a great debt to the model railroad world. The whole concept of recreating vehicles—and entire scenes—in miniature was introduced by model railroad manufacturers a century ago. There were commercially available model trains well before plastic kits came out. You could argue that diecasts also predated plastic kits, but unlike trains, they weren’t usually used to create a complete scene like a model railroad. It would be oversimplifying things to say there was a direct evolutionary path from the model railroad to the diorama. A better suggestion might be to think of them as following parallel paths, with the model railroad getting a head start on the historical timeline. There’s a lot of overlap between them. Both use realistic miniatures to depict places and events. Not all dioramas feature the lights and moving vehicles common to model railroads, and not all model railroads place as much of a premium on realism as do dioramas. But the similarities are there. A good example of the overlap between model railroads and dioramas is Miniatur Wunderland in Hamburg, Germany (http://www.miniatur-wunderland.com/). Billed as the “largest model railway in the world,” this permanent HO exhibition features several distinct sections depicting both actual and fictional locations. What’s interesting about Miniatur Wunderland is that it’s much more than a model railway. There are moving cars, buses, ships, and even aircraft (not only can you see planes taxiing on the runway, but taking off and landing as well). To call it a model railway doesn’t really do it justice. With the variety of vehicles and scenes featured, you could call it a mega-diorama. Not too long ago, there seemed to be several hobby shops in every city. And plastic model kits were popular enough that they were a staple of the toy section in most major department stores. I remember those days fondly. The toy section was the only saving grace for young boys forced to accompany their mothers on shopping trips downtown (I speak from experience). With a little prodding, mom could be persuaded to drop by the toy section after all the boring necessities (clothes, household supplies, etc.) had been purchased. As a teen, I remember embarking on long bike rides and trips on city buses to visit local hobby shops whenever possible. Sometimes a friend and I would organize a day trip to another city to see the sights, which inevitably included a hobby shop or two. Even our family vacations were not complete without a visit to the local hobby shop. This was before the advent of the Internet, so who knew what unique products might be found in a hobby shop located in another city or country? Sadly, many hobby shops have closed their doors over the last several years. 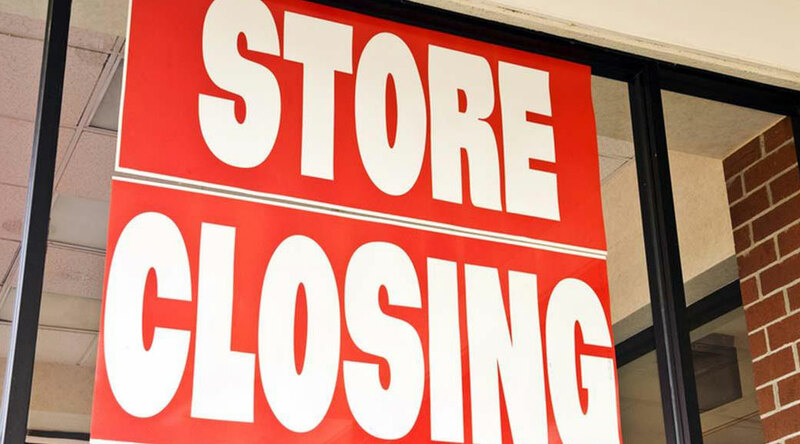 Some of these closings are due to the shift in retail from bricks and mortar to online, which can be seen in many retail categories. But research from IBISWorld confirms that profit margins for hobby shops have been steadily declining over the past decade, and this has forced many small independent stores out of business. Only the larger online retailers, who can negotiate volume discounts that small mom and pop stores have no hope of matching, are surviving. Model kits are ideally suited to online retail, since plastics are lightweight and inexpensive to ship. For buyers, the advent of online shopping is nothing short of revolutionary, and in a good way. I can now locate the most obscure decal sheet, aftermarket part or thirty year old kit in minutes and have it delivered from anywhere in the world. Another benefit of the online shopping revolution is the surge in producers of garage kits. Now, with the help of a website, any talented individual can produce and sell resin kits to buyers worldwide. This also increases choice for the buyer, since subjects which are too obscure for major manufacturers to mass produce are covered by garage kit producers who can make a profit on very low volumes. There’s a part of me that misses the bricks and mortar shopping experience. That sense of anticipation: “what cool new items am I going to see on the shelf when I open the door and walk in?” And once you enter, the chance to talk about the fine points of modelling with the store owner. This is missing from online shopping. Yes, we have online forums where people can talk about modelling, but it’s not the same. People act much worse online, protected by a cloak of anonymity, than they do face-to-face. This is why online forum discussions tend to resemble food fights in a school cafeteria. Another trend I’ve noticed is that model kits in hobby shops have begun sharing shelf space with fully assembled (or almost fully assembled) diecast miniatures. 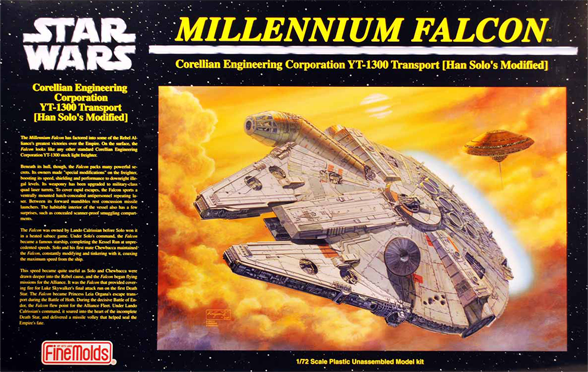 Diecast cars from the likes of Corgi and Dinky have been around for decades, but now diecasts of aircraft and science fiction subjects have become popular. And they are offered in the same scales as plastic model kits, meaning that they are being positioned as direct competitors. It appears that diecasts are popular with adults as well as children. If hobby shop owners are sacrificing plastic model kit shelf space for ready-made diecast miniatures, there must be a reason for it. The obvious one is a shift in demand. Perhaps fewer people are willing to spend the time to assemble and paint a plastic model kit. They want the payoff—a realistic aircraft replica to display in the living room—without the work. In today’s world of condensed sound bites and abbreviated text messages, few can muster the focus needed to devote several hours to reading a novel or putting a plastic model kit together. Parents equip their kids with smart phones and video games, which reduce attention spans and train them to expect instant gratification. Public schools are not helping either: although children are still taught to print, the teaching of cursive is being phased out. The elegant art of handwriting will soon be a thing of the past, replaced by typing at a computer keyboard. How will this impact the manual dexterity of future generations? Picking up a pen and learning cursive is an important part of developing motor skills. Someone who doesn’t know how to manipulate a pen may find themselves challenged by other tasks requiring fine manual motor skills as well. These skills are de rigueur for gardening, cooking, and home repairs, to name just a few. Where will the next generation of surgeons (whose level of manual dexterity can have life or death consequences) come from? I recently asked a hobby shop owner if he thought the increase in demand for diecast replicas was due to a downturn in the popularity of model building. He wouldn’t admit to it, despite the fact that there were several shelves of diecast aircraft in his store. He pointed out that buying a diecast replica and displaying it on a bookshelf doesn’t give the buyer the feeling of accomplishment that he gets from putting a plastic model kit together. And he seemed strenuously opposed to the idea that building models was going out of style. But then why was he carrying diecast products? Based on the IBISWorld research, discretionary spending on hobbies in general has been down since the 2008 recession, so it’s probably safe to say that there are fewer plastic model hobbyists today than a few decades ago. If I had to guess, I’d say the golden age of modelling was somewhere around the end of the 20th Century. Long-time manufacturers like Revell and Airfix had been joined by newer companies such as Tamiya and Hasegawa, and the latter elevated the quality and accuracy of their products to new levels. Lots of people seemed to be building plastic models. On a positive note, most of the top plastic model manufacturers are still in business, and they continue to introduce new products every year. In the end, what matters is not whether everyone else loves what you do, but that you love what you do. It’s inevitable that the popularity of plastic modelling will wax and wane over time, just like everything else, so why worry about it? Thinking of your diorama as a 3D photograph is a good way to evaluate its visual impact. Although a photo is two-dimensional and therefore less complex than 3D art like dioramas and sculptures, it’s easier to start with the basics. In other words, it makes sense to master 2D design principles before moving on to 3D. Here are some questions a photographer asks when composing a photo: Does the eye naturally gravitate towards the main subject? Is colour used effectively? Is the composition visually balanced? The discerning photographer will go a step further, and consider how well a photograph creates a mood. A photo can be positive and upbeat or sombre and depressing. It can create tension. It can arouse anger. It can create a sense of awe. Many years ago, on vacation in New Orleans, I walked into an antiques shop which included large format original prints by famous photographers. Turning to take the stairs to the second floor, I looked up. 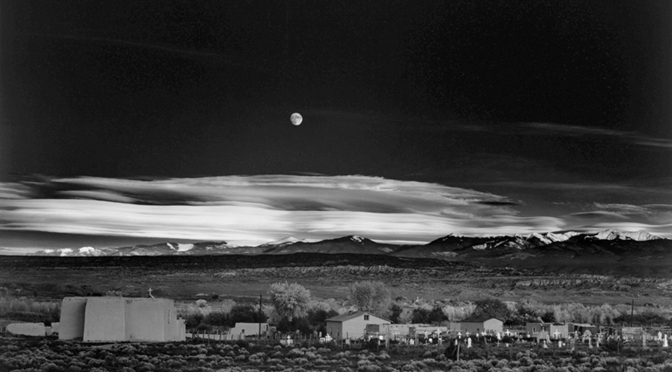 At the top of the staircase was a 4×6 (feet, not inches) print of Moonrise, Hernandez, New Mexico by Ansel Adams. This was one of those rare occasions where everything seems to go quiet and time stands still. I slowly made my way up the stairs and paused in front of the photo for several minutes, mesmerized. To this day, I don’t recall seeing any work of art that could rival that photograph for its power to inspire a sense of awe. And that includes anything in The Louvre, MOMA, and countless other galleries and museums I’ve visited. Think back to the last time you saw a truly memorable photograph or painting—one that you found yourself still thinking about after you left the art gallery. Chances are it touched you emotionally in some way. When you embark on your next diorama project, think about how you can create an emotional connection with your viewer. As someone who loves art, I’ve often wondered how many diorama builders see themselves as artists, and see their creations as works of art. We accept without hesitation that a photograph, sculpture or painting is a work of art. But what about dioramas? We could take the easy way out and remain agnostic, like The Joker who said in Tim Burton’s Batman: “I don’t know if it’s art, but I like it.” But let’s explore the issue and see what happens. Since the vast majority of dioramas are populated with commercially available plastic models, the purist might argue that they contain content which is not 100% original. Therefore, they cannot be considered original works of art. And although some dioramas rely more than others on off-the-shelf models, the purist would argue that any non-original content immediately disqualifies the diorama as a true work of art. 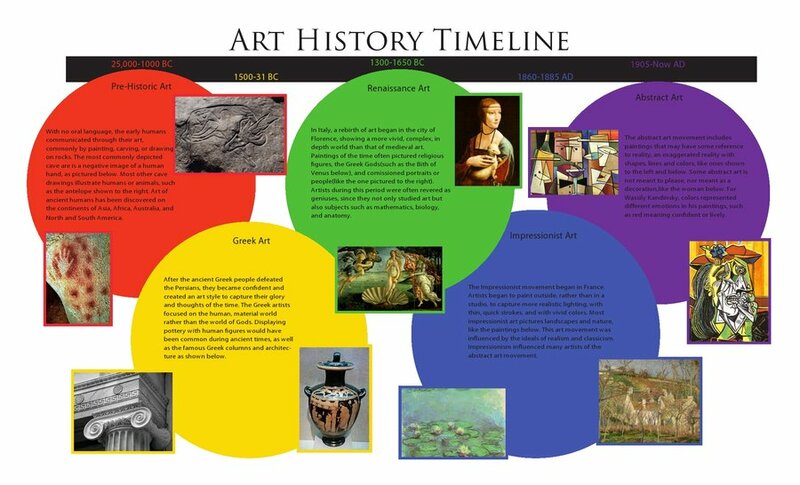 I would argue that the “original content” argument is of little or no relevance in the present day world of art. Ever since Pop Art emerged in the 1950s, measuring the amount of original content in a piece of art has become irrelevant. I recently saw a sculpture at an art show which was made entirely of Lego blocks. Photography is another art form which does not hold up particularly well to the “original content” argument. The landscape photographer does not construct anything that appears in his photo. The content was conveniently created for him billions of years ago. He “borrows” content from his immediate surroundings every time he presses the shutter release. By manipulating variables such as lighting and composition, he creates a work of art which qualifies as “original,” even though the physical content depicted in the photo is not of his own making. Most of the time, the photographer is able to borrow the content for his photos with little or no protest—but not always. Photographers have gotten into costly and embarrassing legal scrapes for photographing people and places without permission, which is arguably worse than being unoriginal. I have yet to see this fate befall a diorama artist. Another protest we often hear when debating the diorama’s place in the world of art is its association with children’s crafts. But children make lots of things when emulating adults. A child’s sand castle is a sculpture, but no-one would accuse Rodin’s sculptures of being glorified sand castles. Children also love to finger paint, a technique appropriated by numerous modern artists of the 20th Century. Painter Jackson Pollock liked to lay his canvases on the floor and then fling, drip and spatter paint over them. Luckily, his parents were not around to make him clean up the mess. If we adopt the position that anything exhibited as art is a work of art, then the diorama easily qualifies. Several have been featured at art fairs, alongside art of every description. And in countries around the world, people pay admission to admire professionally built dioramas. I’m not talking about museums which often contain historical dioramas to support the exhibits, but dedicated diorama galleries. So how did the diorama become a wallflower at the art world’s high school prom? Without a dedicated PR team, perhaps it was inevitable. We diorama artists tend to be quiet types who don’t care what the world thinks of us. We are not likely to be found trumpeting our achievements on Facebook or Twitter, or taking selfies in our studios. And it’s a safe bet we’ll never have our own reality show. We prefer to create, not promote. And for most of us, the satisfaction we get from finishing a project is enough. But if you feel that recognition is an important part of the experience of building dioramas, I have a simple suggestion. And you don’t need a PR team. Here is what you do: The next time someone asks you how you like to spend your spare time, don’t hang your head sheepishly and mumble something in hushed tones about plastic models. Look them in the eye and tell them you’re an artist. I guarantee you’ll feel a lot better by the end of the conversation. Many modelers are content to build an out-of-the-box plastic model kit, display it on a shelf, and call it a day. 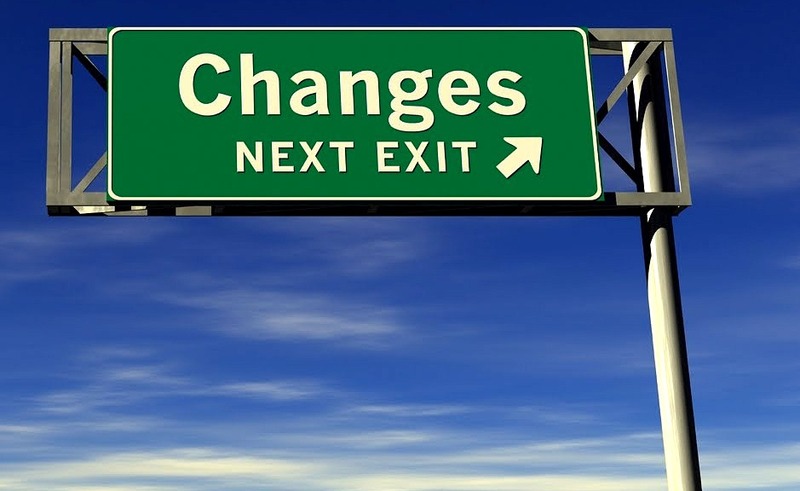 Some will go a step further and buy aftermarket parts to improve the accuracy of their model or modify it. And those who are even more ambitious will kitbash a model, creating something new out of one or more out-of-the-box kits. If you enjoy going a step or two beyond the basic out-of-the-box build, chances are you’ve thought about creating an entire scene to showcase your latest model(s). Welcome to the world of dioramas. The diorama is a miniature slice of reality depicting an event or its aftermath. It is limited by only two things: your imagination and your skill at translating vision into reality. You can create a scene taking place on land, at sea, or on another planet. You decide what characters, vehicles and buildings will populate the scene, and what event will be depicted. Most diorama artists have no shortage of imagination. The real challenge is translating your vision into a finished diorama. This sounds simple but can be a challenge for artists of all stripes. When George Lucas was deciding which of his Star Wars movies to film first, he realized that 1970s-era special effects would not do justice to all the scenes he had envisioned for the saga. He started with Episode 4 because it had the least demanding special effects, which could be achieved using the technology of the day. To render your vision to its fullest potential, you must not only be a good craftsman, but make the right artistic decisions as well. Every work of art starts with an idea. Then the idea is usually fleshed out as a design. This could be as simple as a pencil sketch, or as complex as a computer generated 3D model. Some diorama builders skip this step, and run the risk of ending up with something that is awkwardly composed and visually weak. For myself, I’ve found that the more dioramas you create, the better you get. As you become familiar with the diorama form, you learn to see what works and what doesn’t. Most artists go through a learning curve. There are, of course, exceptions. Orson Welles made his most critically acclaimed film, Citizen Kane, at the beginning of his career as a filmmaker. Reflecting on his career in his later years, he liked to joke that he started at the top and worked his way down. But he was an exception. The mistake many diorama artists make is not realizing that they are creating a work of art. They see themselves as hobbyists and balk at the term “artist.” But if you don’t see yourself as an artist, you’re handicapping yourself from making progress. Your dioramas may be well crafted, but no-one will see them as art unless you do. So stop being modest. You don’t have to start hanging out at the art gallery and using words like “iconicity.” But having a basic knowledge of design principles is useful. Brush up on these and it’ll make a big difference to your next diorama.